which is what we’ve all learned to do. AUTHOR’S NOTE ON THE PHOTO: Snagging my man . . . and his last name, too. 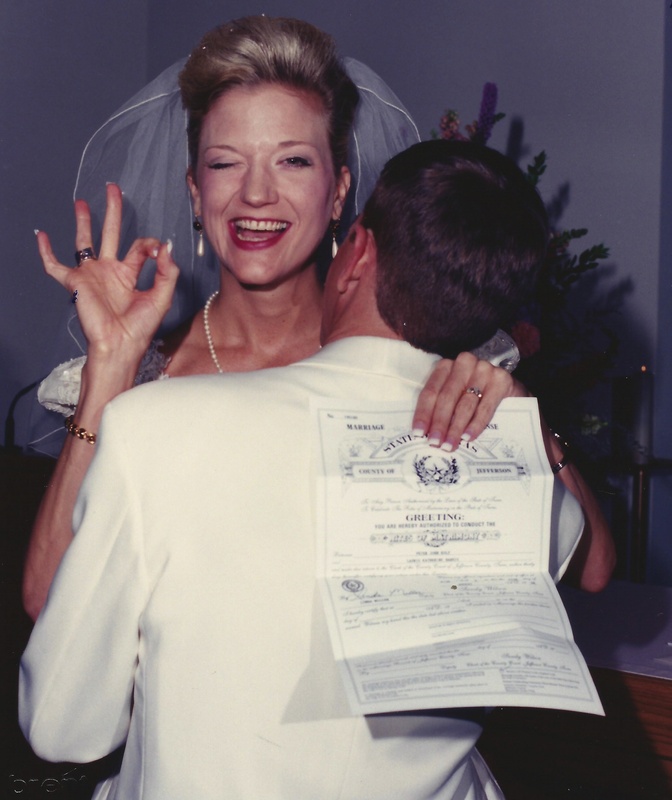 Our wedding day, 9/19/98. NOTE FROM THE AUTHOR: I’ve incorporated all the different ways people say Kolp: cope, kelp, coil, Coe, coal, clop. I guess the closest is coal with a P.
ABOUT THE AUTHOR: Laurie Kolp is an avid runner, lover of nature, mother of three, and wife to former Marine who enjoys living life one day at a time in Southeast Texas. She is the author of Upon the Blue Couch (Winter Goose Publishing, 2014) and Hello It’s Your Mother (Finishing Line Press, October 2015). Recent publications include the 2015 Poet’s Market, Scissors & Spackle, North Dakota Quarterly, Red River Review, and Pirene’s Fountain. You can find out more about Laurie on her website, http://lauriekolp.com. our neighbor had a cousin named Laurie and she had the same problem. But Kolp… that should be so hard for people. and I totally love this photo of you, Laurie. It really captures your personality. Love the picture! Love the poem. With the simple last name of Chast which rhymes with last, fast, and compare and contrast–I have been chest and chaste too many times to ponder. Reading your poem, I finally laughed about it. Thank you! LOL… you made me laugh too, Susan. I have a friend named Arnebya. When asked how to pronounce it she invariably responds, “Lisa.” I love her. I shared this with her. I’m sure she’ll be able to relate. Hi, Jennifer… I’d love to meet “Lisa”. Superb poem Laurie! Great photo also … with a last name that has 3 syllables but is pronounced properly with 2 … I feel your pain (a little bit at least, I think it’s because names are such personal things) Nice to see you published here – kudos. Sharon- I never knew some people pronounced your last name with 3 syllables. I’m also not sure how I automatically knew it was 2.